Home » Sports » Could it be Magic vs. Bird ... for Paul George? Could it be Magic vs. Bird ... for Paul George? Paul George wants to stay in Indiana. But like so many things this time of year, when the phones are ringing off the hook in NBA offices as the trade deadline nears, the situation between the four-time All-Star and his Indiana Pacers is racked with nuance. So when George met with team owner Herb Simon in recent days and told him that the Hoosier state was still the place for him, how he would love nothing more than to eventually go down as the greatest Pacer of them all, it came with one qualifier. If they can contend for a title. According to a person with knowledge of the meeting who spoke to USA TODAY Sports on the condition of anonymity because of the sensitivity of the situation, that is the crossroads that Pacers president Larry Bird now faces. If the Thursday deadline comes and goes and the Pacers roster remains the same, the pressure rises in a significant way. George will be a free agent in the summer of 2018, and it’s no secret that the 26-year-old Palmdale, Calif. native would love nothing more than to sign with his hometown Lakers if the future is bleak in Indiana. The fact that the Lakers are in the process of trying to land George right now, with new lead executive Magic Johnson moving fast to fill that superstar hole that Kobe Bryant left behind, only makes these next two days all the more compelling. Magic & Bird, together again as NBA power brokers, on Day No. 2 of Johnson’s new job. You can’t make this stuff up. Bird is known to be searching for options that would ease George's concerns, inquiring about players like Philadelphia’s Jahlil Okafor, the Sacramento Kings’ Arron Afflalo, Portland’s Allen Crabbe and Ed Davis. Yet if he can’t make significant moves, and if the Pacers (29-28, sixth in the Eastern Conference) seem destined to tread water while George ponders the notion of heading West, then maybe it's time for Bird to turn the page on the Paul George era. The George landscape is complicated elsewhere, too, in large part because of his desire to sign with the Lakers if the Pacers experience simply doesn’t pan out. The Boston Celtics, with fellow 80s/90s star Danny Ainge at the front office helm, must ponder factors such as these as they decide the price worth paying. That reality, that enormous risk, exists for all other suitors as well. George still has dreams of being bigger than Reggie Miller, of giving this franchise its first NBA championship and one day seeing his jersey up in the Bankers Life Fieldhouse rafters. But his gruesome leg break in the summer of 2014 taught him that time waits for no man, that every day on the court is a blessing after he spent more than a year working his way back. He wants to win a title, and he wants nothing more than to do it Indiana. It’s up to Larry Legend to get these Pacers back in the game now. Should Celtics chase Jimmy Butler or Paul George at the deadline? It's a fever dream for fans of the Boston Celtics. Rumors linking Boston to a pair of star players, Jimmy Butler of the Chicago Bulls and Paul George of the Indiana Pacers, are circulating in advance of Thursday's NBA trade deadline. While odds are both players will end up staying put for now, let's suspend disbelief and imagine that both teams would trade their star wing for identical packages along the lines of the one I outlined the Celtics offering for Butler in Tuesday's analysis of his value. If it were truly Boston's choice, should they pick Butler or George? The Los Angeles Lakers are among the teams to have inquired about the availability of Indiana Pacers star forward Paul George in recent days, according to league sources. While the conversation didn't go beyond an initial expression of interest -- which is common in the NBA in advance of the trade deadline -- it's notable simply for the names involved: New Lakers president of basketball operations Magic Johnson and Pacers president Larry Bird, lifelong rivals and close friends, were on the phone together. On his first full day in charge, after Tuesday's stunning promotion from an advisory role in the wake of the twin dismissals of longtime Lakers general manager Mitch Kupchak and executive vice president of basketball operations Jim Buss, Johnson arrived at the Lakers' offices early Wednesday to work the trade phones and, yes, throw in a call to Bird. USA Today reported Wednesday that George recently met with Pacers owner Herb Simon to expound face-to-face on what he told ESPN's Marc Stein last week during All-Star festivities on ESPN Radio: George still longs to lead Indiana to its first NBA championship but wants to know he's part of a title-contending roster before committing to a lucrative contact extension this summer. Sources confirmed to ESPN in the wake of that meeting with Simon that Indiana has since invited teams like the Lakers and Boston Celtics to make pitches for George this week in advance of Thursday's 3 p.m. ET trade deadline. The Pacers, at the same time, also continue to pursue roster upgrades of their own, after ESPN's Chris Haynes reported last week that the Pacers have made their first-round pick in the June draft available in current trade conversations in hopes of strengthening George's supporting cast. Johnson has wasted little time getting busy since he was handed control of basketball operations by Lakers president and co-owner Jeanie Buss, quickly sealing a trade Tuesday afternoon with Houston for a future first-round pick and veteran swingman Corey Brewer in exchange for high-scoring guard Lou Williams. Johnson also addressed the Lakers' players and coaches when they reported for practice Wednesday afternoon at 1 p.m. PST. "Magic came down and talked to the team," Lakers coach Luke Walton said. "He wanted to come down and, first of all, say hi to everyone and let them know that he's here to support and be there for them. It was a quick meeting, but it's good to get in front of each other. "It was a strange day because I am very close with Jimmy and Mitch and I really enjoyed working with them," Walton continued. "I had great talks with both of them on the telephone afterwards. They were both very supportive. Both gave the message of continue to work, keep working with the young guys. It was definitely a little sad. I think it's important to remember all the great things they did when they were here, too. "Then, on the other hand, you have Earvin coming in and he's in there and he's making phone calls. It was great to work with him. It was a unique, interesting day in terms of the emotions going on. But the main thing everyone talked about was 'We have a job to do still.'" As for the possibility of more trades from the Lakers before the deadline, sources say Johnson is far more likely to move a veteran such as Jose Calderon or Nick Young than anyone from L.A.'s young core. A trade for George, who grew up a huge Lakers fan in nearby Palmdale, California, is considered unlikely at this point. The initial conversation between Johnson and Bird, sources say, never got beyond pleasantries. 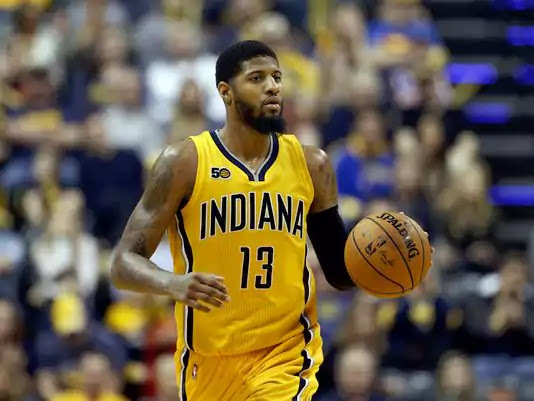 Sources say numerous interested teams around the league, furthermore, believe the Pacers have been fielding calls on George in recent days more to get a detailed read of the market for potential down-the-road deals as opposed to a serious intent to trade George this week. The Celtics, however, are widely known to be eager to trade for either George or Chicago's Jimmy Butler. So the possibility remains that a strong offer from Boston on deadline day, before Thursday's trade buzzer, spurs the Pacers into trading George sooner than they ever imagined. But the Indiana star gave little indication, after the Pacers' first practice coming out of the All-Star break, that he expects a deal this week. "I have no concerns," George told local reporters. "I'm here. I practiced today. My head is not wrapped around that. I've got a team to turn around in the second half and that's what I'm committed to." George is scheduled to become a free agent in the summer of 2018. In last week's interview with Stein, when asked about the possibility of signing the $200-plus million contract extension Indiana is expected to offer him this summer, George said: "As I told Larry, I always want to play on a winning team. I always want to be part of a team that has a chance to win it [all]. That's important. ... I want a chance to play for a chance to win a championship." The Pacers lost six straight games entering the All-Star break and sit sixth in the Eastern Conference at 29-28. ESPN first reported earlier this week that Philadelphia's Jahlil Okafor was among the targets Bird has pursued to fortify the roster around George, Myles Turner and Jeff Teague. Indiana can't offer George one of the league's new designated player extensions -- in excess of $200 million in this case -- unless he makes one of the league's three All-NBA teams this season. The 26-year-old, having recovered admirably from the gruesome leg fracture he suffered on Team USA duty in the summer of 2014, is averaging 22.3 points and 6.2 rebounds this season. 0 Response to "Could it be Magic vs. Bird ... for Paul George?"